Annie’s militant suffragette action with Christobel Pankhurst earned her several terms of imprisonment, where she went on hunger strike and underwent force-feeding many times, always determined to confront the authorities. Once, just after she’d been released from prison in 1914 in a very weak state, she had to be carried into a meeting in Knightsbridge on a stretcher which was then laid between two chairs on the platform. Suffragette militancy was called off during the First World War, so Annie spent her time persuading Trades Unions to support war work. After the war, when women over 30 won the vote in 1918, she married in April 1920 at Lytham Parish Church to James (Jim) Taylor, a metal worker. A friend described him as “quite simple like Annie”. From 1923 they lived at 1 Camper’s Road, Letchworth after Taylor was appointed maintenance engineer at St Christopher School, Letchworth. Their son, Warwick Kenney Taylor, was born in February 1921, after which Annie led a quiet domestic life, devoted to her son. Jim Taylor taught some handicraft work part-time, and was appointed an instructor in the Government Training Service in 1930. He rose to become Assistant Manager of the Service’s Letchworth training centre. He also had a “divine” singing voice and at one time had aspirations to a musical career. He was active in the community in Letchworth, in particular in local music and drama groups. Jim Taylor claimed his wife never really recovered from her hunger strikes and, after a long and steady decline, she suffered a stroke and “died of diabetes” at the Lister Hospital in Hitchin (which was then near Chalkdells, to the west of Bedford Road in Hitchin) on 9th July, 1953 aged 73. Her funeral was conducted according to the rites of the Rosicrucians and her ashes were scattered by her family in a Lancashire valley. Jim, when he retired in 1958, embarked on an extended tour of Europe by moped. Their son Warwick died “peacefully on January 4th 2007 in Southwold”, leaving a widow. 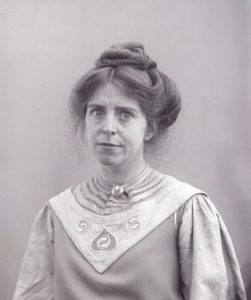 There is more information about Annie Kenney here. The Kenney papers are held at the University of East Anglia Archives. Their website has more information about her.